Get the simple talking points you need to strengthen your client relationships with a free two-week trial of The Sevens Report. There is virtually no chance the Fed will hike rates at tomorrow’s meeting, as the chances were slim before the recently disappointing economic data. Now, those chances have declined to near zero. 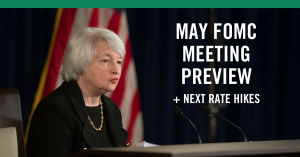 The key question tomorrow is: Just how forcefully will the Fed telegraph the next rate hike? The answer to that question, taken in the important context of the recent slowing of economic momentum, will decide whether the FOMC decision pushes stocks higher, or whether we see a retracement of the recent gains. Hawkish If: The Fed clearly signals a rate hike is coming in June. Right now, Fed fund futures are pricing in about a 70% chance the Fed does hike rates, but that’s not a consensus expectation, yet. If the Fed specifically points to the “next” meeting in tomorrow’s statement (as it did in the fall of 2015 and 2016) as the likely date of the next rate increase, you will see markets react hawkishly as a June rate hike is not a foregone conclusion. Additionally, if the Fed is still intent on hiking rates in June despite recent economic data disappointments, that might imply a Fed that is more hawkish than previously expected. Likely Market Reaction: Withheld for subscribers. Unlock with a free two-week trial of The Sevens Report. Meets Expectations If: The Fed slightly downgrades the assessment of the economy in paragraphs one and two, but also says any slowing of activity is likely only temporary (it’s the temporary part that is the key). Markets expect the Fed to acknowledge the modest loss of economic momentum, but not to make too big a deal out of it. Dovish If: The Fed materially downgrades economic commentary in paragraph one and downgrades the outlook on inflation, and in doing so materially reduces the chances for a June rate hike. Specifically, to be dovish we would need to see 1) A downgrade of both the growth and inflation language in paragraph one, plus no mention of it being temporary. The net effect would be to remove the expectation for a June rate hike. 1) When will the Fed begin to reduce the balance sheet (2017 or 2018)? 2) What securities will the Fed stop buying (just Treasuries or Mortgage Backed Securities, too)? 3) How will the Fed stop reinvesting proceeds (all at once, or gradually)? How these questions are answered will determine whether the Fed balance sheet is a hawkish influence on markets (yields up, stocks potentially down). I (and almost everyone else) do not expect the Fed to touch on this in this week’s meeting. However, if the Fed does address this topic, it will come in paragraph five of the statement. Any change there will likely have hawkish implications on markets tomorrow, but again any changes are unlikely. Did Trump Just Kill The Reflation Trade? An excerpt from today’s Sevens Report. President Trump, in an interview with the WSJ yesterday, appeared to change his policy on the Fed and interest rates. Specifically, Trump said he thought the dollar was getting too strong, that he favored a low interest rate policy, and he was open to keeping Yellen as Fed Chair. It was the second two comments that caught markets attention and caused a “dovish” response in the dollar and bond yields (both of which fell). The reason these comments were a surprise was because it was generally expected Trump wouldn’t keep Yellen and was in favor of a more hawkish Fed Chair and appointing more hawkish Fed governors (there are currently three vacancies on the Fed President Trump can fill). So, the market was expecting Trump to be a hawkish influence over the coming years, but yesterday’s comments contradict that expectation. Going forward, from a currency and bond standpoint (the short term reaction aside) I do not see Trump’s comments as a dovish gamechanger for the dollar or rates. Yes, near term it appears the trend for the dollar is sideways between 99.50ish and 102 while the 10-year yield has broken below support at 2.30%. But, I don’t see Trump’s comments sending the dollar back into the mid 90’s, nor do I see them sending the 10 year yield below 2%. I also don’t expect this dovish reaction to be a material boost for stocks, because dovish isn’t positive for stocks any more (in fact the comments are causing the stock sell off this morning—more on that in minute). Bigger picture, the longer-term path of the dollar and bond yields will be driven by growth, inflation and still ultra-accommodative foreign central banks. Better economic growth (either by itself or with policy help) is the key to the longer-term direction of the dollar and rates (and we think that longer-term trend remains higher). However, in the near term, his comments sent the 10 year yield decidedly through support at 2.30%, and that is causing stocks to drop as Treasury yields continue to signal that slower growth and lower inflation are on the horizon. And, since the market has rallied since the election on the hopes of better growth and higher inflation (i.e. the reflation trade) this drop in yields is hitting stocks. The violation of support in the 10 year yield at 2.30% is important and a potentially near term bearish catalyst for stocks. If the ten year yield doesn’t stabilize and make some effort to rally over the next few days, a test of 2300 or 2275 in the S&P 500 would not shock me. Cut through the noise and understand what’s truly driving markets, as this new political and economic reality evolves. Get your free 2-week trial at the Sevens Report. 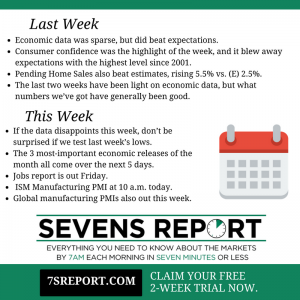 “Last Week and This Week in Economics”—an excerpt from today’s Sevens Report: everything you need to know about the markets in your inbox by 7am, in 7 minutes or less. Economic data was sparse again last week, but what data did come beat expectations (although it didn’t do a lot to bridge the gap between survey-based indicators and hard economic data). Still, the numbers did continue to be enough to offset growing Washington noise. Consumer confidence was the highlight of the week, and it blew away expectations. The number rose to the highest level since summer 2001, coming in at 125.6 vs. (E) 113.8. While a strong number, that is another sentiment survey, and these soaring sentiment surveys need to start reflecting in the hard data starting in Q2 (remember, Q1 GDP is still expected to be around 1%). The other notable number last week was Pending Home Sales, which also beat estimates, rising 5.5% vs. (E) 2.5%. The biggest takeaway from the March housing data is that it appears higher mortgage rates are not hurting the residential housing market, and that’s an important but underappreciated tailwind on the economy, generally speaking. Going forward, a stable housing market remains critical if there’s any hope to seeing a material economic acceleration. Bottom line, the last two weeks have been light on economic data, but what numbers we’ve got have generally been good, and as a broad statement the economic data has continued to offset lack of progress in Washington… but that trend will be put to the test this week. After two quiet weeks of economic releases, we more than make up for it this week, as the three most-important economic releases of the month all come over the next five days. From a broader context standpoint, with Washington stuck in neutral and hopes of big tax reform fading, economic data needs to stay firm to support stocks. If the data disappoints this week, don’t be surprised if we test last week’s lows. The most important release this week is Friday’s jobs report. We will do our typical “Jobs Report Preview” later this week, but again it’s important this number is Goldilocks, in that it’s strong enough to support the market, but not so strong that it makes a May rate hike more likely. The next most-important release this week is the global manufacturing PMIs (out today). The European and Asian numbers have already been released, and focus now turns to the March ISM Manufacturing PMI at 10 a.m. today. This number is taking on a bit more significance due to the disappointment of the flash manufacturing PMI of two weeks ago. It hit a surprise six-month low, so markets will want to see the ISM Manufacturing PMI refute that reading. The manufacturing PMI is followed by the global manufacturing PMIs out Tuesday night/Wednesday morning. Those reports will again potentially confirm the uptick in global growth, and especially in Europe, where numbers have been strong lately. Domestically, it’s the same story. Economic data needs to support this market in the face of disappointment from Washington. Failure to do that puts this rally at risk. The only other notable event this week will be the ECB minutes. If the minutes read hawkish, that could put a temporary headwind on HEDJ and long Europe positions. But a dip will likely be a buying opportunity in HEDJ. Help your clients outperform markets with the Sevens Report. Claim your free trial today: 7sReport.com. Last week was generally “Goldilocks” from an economic data and Fed standpoint, as economic data continued to be buoyant while the Fed successfully executed a dovish hike (at least in the short term). Starting with the Fed, the FOMC hiked interest rates 25 bps, as expected, but left the dot projections for 2017 and 2018 unchanged at three hikes each. Given market expectations for an increase in the dots, the reaction was immediately dovish (stocks up, bonds up, gold up, dollar down). If inflation data keeps rising and economic activity accelerates (or we actually get corporate tax cuts) the answers to those rate hike questions will be “soon,” and “more than three times.” Point being, don’t confuse the short-term dovish reaction with a reduction in risk from a hawkish Fed throughout 2017. The risk hasn’t changed. Looking at the economic data last week, it showed an ongoing “reflation trade,” as inflation and growth data beat estimates. Both February PPI and CPI ran a touch “hot,” and showed either bigger-than-expected monthly increases (PPI) or year-over-year price increases that were the biggest in several years (headline CPI rising by 2.7%). Meanwhile, the first economic data points from March, Empire Manufacturing and Philly Fed, also both beat expectations. Philly was 32.8 vs. (E) 30.0 and New Orders, the leading indicator of the report, rose to 38.6, which is the highest since 1983! Actual “hard” economic data last week was a touch disappointing on the headline as Retail Sales met expectations and the “Control” group (the best measure of discretionary consumer spending) rose just 0.1% vs. (E) 0.3%. Revisions to the January data were positive and offset the disappointment, though (January control retail sales were revised to 0.8% from 0.4%). It was a similar result with February Industrial Production being flat vs. (E) 0.2%. However, January data was revised slightly better to -0.1% vs. -0.3%. Meanwhile, the manufacturing sub-index was more positive (up 0.5% vs. (E) 0.4% and January was revised to 0.5% from 0.2%). Bottom line, the “hard” economic data continues to lag the “soft” sentiment data (i.e. Philly/Empire Surveys) and the running estimate for Q1 GDP (the Atlanta Fed’s GDP Now) is just 0.9%, the lowest in nearly a year. Again, it’s not an indictment of the rally just yet, but at some point, that GDP number needs to start to rise to meet the surging survey data, otherwise we’ve got a problem. This Week: Economically speaking this will be a generally quiet week, as the notable data doesn’t come until Friday via the global flash PMIs and February Durable Goods report. Yet despite the small number of reports, the data is still important, because it has got to continue to help support stocks in the face of ever-dimming policy prospects. So, those numbers (especially durable goods) need to continue to imply economic acceleration. Other data to watch this week includes housing data (New Homes Sales Wednesday and Existing Home Sales Thursday), but generally housing continues to hold up well in the face of generally higher rates. The Sevens Report is everything you need to know about the market, in your inbox by 7am each morning, in 7 minutes or less. Get a free trial! 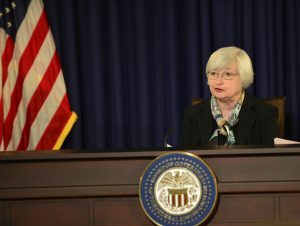 The FOMC raised the fed funds rate 25 basis points, as expected. Below is an excerpt from the full Sevens Report, focusing on the takeaways from the March 15, 2017 Fed meeting. 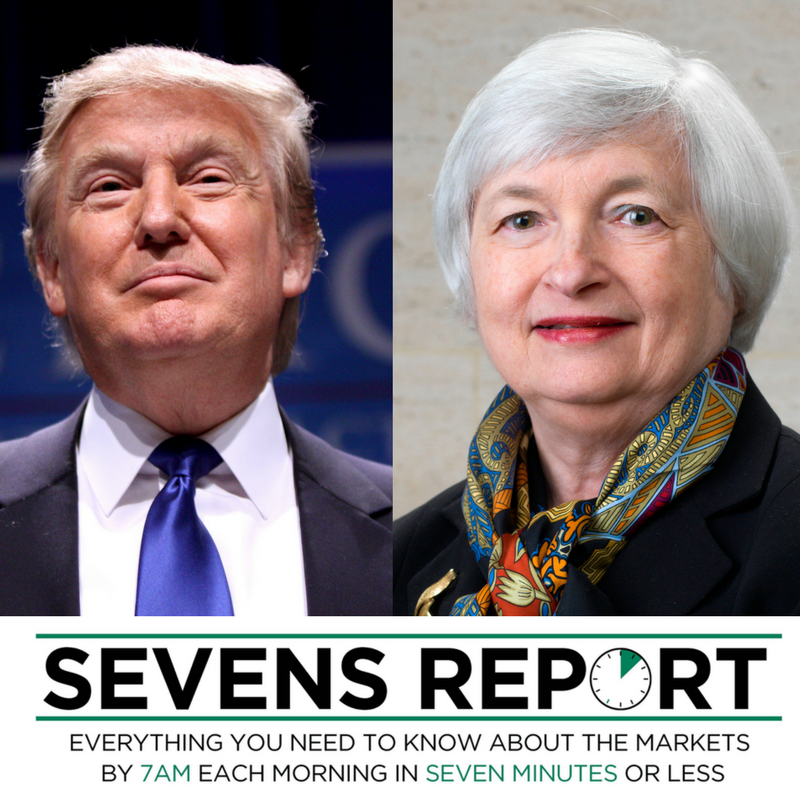 The Sevens Report is everything you need to know about the markets in your inbox by 7am in 7 minutes or less. Sign up for a free 2-week trial today! The results of this meeting largely met our “What’s Expected,” scenario, as the Fed did hike 25 basis points, but the median “dots” for the number of hikes in 2017 and 2018 were unchanged at three in each year. So, the Fed generally met well-telegraphed expectations, and the market took it dovishly (as you’d expect). Futures doubled their pre-Fed gains while the dollar dropped sharply and bonds rallied. Yet, despite the initial moves, I don’t see Thursday’s Fed decision as a bullish game changer, simply because unless we get a surprise downturn in economic data (which won’t be good for stocks), risk still remains for more rate hikes going forward. So despite the somewhat confusing Fed tactic of rushing to hike in March, only to keep the statement and projections dovish, I’m sticking with my expected market reactions… Stocks rallied, but this isn’t a bullish game-changer; bond yields dropped but it’s likely not a reversal in the uptrend in yields (same for the dollar), and gold rallied and while we may not see a sustained rally just yet, the outlook is becoming more favorable. Going forward, the market still expects two more hikes in 2017, with June being a close call. February CPI rose 0.1%, meeting expectations. CPI inflation data largely met expectations on March 15th and the numbers likely didn’t have any effect on the FOMC decision. However, the important point here is that PPI and CPI both confirmed inflation pressures continue to build. Case in point, the year-over-year headline CPI rose to 2.7%, which is a five-year high, while core rose to 2.2%, above the Fed’s stated 2% goal. From a practical investment management standpoint, this continues to underscore the need for investors to make sure they are positively skewed to inflation for medium- and longer-term accounts (i.e. more equity exposure, reduced long-term bond exposure, TIPS exposure, select hard asset exposure). February retail sales rose 0.1%, meeting expectations. There was some noise to cut through in this report, because while the headline met expectations, the more important “control” group (retail sales less autos, gas and building materials) rose just 0.1% vs. (E) 0.3%. Again, we and others look at the control group because it’s the best measure of discretionary consumer spending. And while that number did miss estimates, the January data saw a big, positive revision, as the control group went from up 0.4% in January to 0.8%. All in all, the numbers were basically in line. From a market standpoint, this retail sales number still leaves a large and uncomfortable gap between sentiment data (like the Empire Manufacturing Survey and PMIs, which are very strong) and actual, hard data. Case in point, the Atlanta Fed GDP Now estimate for Q1 GDP fell to 0.9%—hardly robust growth. Yes, for now the expectation of better growth is off-setting lackluster hard data, but at some point the hard data needs to start to reflect these high sentiment surveys. This FOMC review is part of the full Sevens Report. For a monthly cost of less than one client lunch, we firmly believe we offer the best value in the independent research space—and you can get two weeks free by signing up for our trial version. Try it today and see what a difference the Sevens Report can make for you every morning. Despite the near-universal expectation of a 25-basis-point rate hike at tomorrow’s FOMC meeting, this meeting contains a lot of very important unknowns regarding the pace of future rate hikes. As such, this meeting is a real, legitimate risk to stocks. 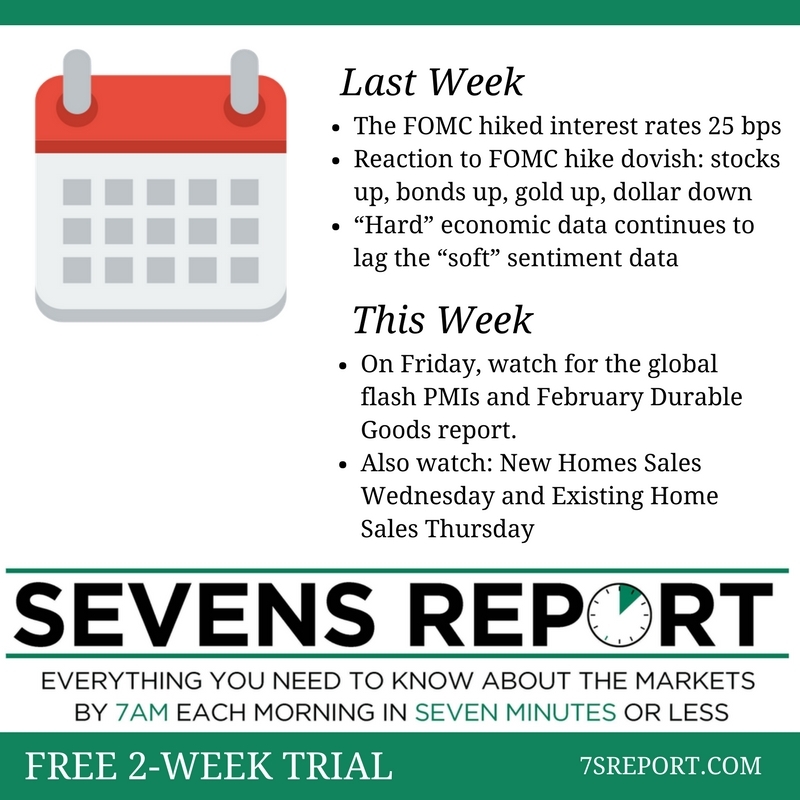 Get our full FOMC preview and all the analysis you need to stay ahead of the market with the Sevens Report. In your inbox by 7am, read it in 7 minutes or less. 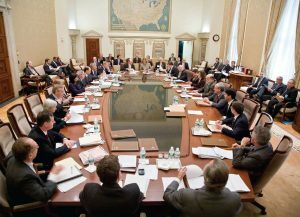 It is not an exaggeration to say this Fed meeting could reflect a paradigm shift in the Fed, where the Fed actually gets serious about normalizing policy and interest rates. Very Hawkish If: 1) The Fed hikes rates 25 bps, 2) The median “dots” show four rate hikes in 2017 and 3) The median dots show four rate hikes in 2018 (currently the dots show just three for both years). Hawkish If: 1) The Fed hikes rates 25 bps, and 2) The median dots show four rate hikes in 2017 or 2018, but not both years. Likely Market Reaction: Restricted for subscribers. Get this data with your free trial of the Sevens Report. Inverse bonds (TBT/TBF/PST), financials (XLF), banks (maybe, but that depends on the shape of the yield curve), TIPS-related bond ETFs (VTIP). ETFs to Underperform: Utilities (XLU), REITs (VNQ) (both interest rate plays), commodity ETFs (DBC), basic materials (XLB), energy (XLE), gold (GLD, GDX). Meets Expectations If: The Fed hikes rates 25 basis points but the dots don’t shift in either year (i.e. the median dots still show three rate hikes in 2017 or 2018). Dovish If: The Fed does not hike rates (this would frankly be a shocking surprise given recent Fed rhetoric). Likely Market Reaction: Stocks, gold and other commodities sharply higher (at least initially). Treasury yields and the dollar sharply lower. The Fed’s Balance Sheet. This is a bit of a confusing topic, but you’re going to be reading a lot more about this in the coming weeks, so I want to cover it now so everyone has proper context. With the Fed hiking rates, it’s quickly approaching the time when the Fed will have to naturally reduce its balance sheet. And what I and others mean by that is the Fed will have to stop reinvesting the principal that it receives when the Treasuries it owns are redeemed. The reason this is important is because it could put further pressure on the bond market. If the Fed gets $100 million in short-term Treasuries redeemed, right now it simply buys $100 million worth of new Treasuries. But, if the Fed were to stop reinvestment, that $100 million wouldn’t go back into the bond market, removing a source of demand. The point is that when the Fed stops reinvesting principal, that will be potentially bond negative/yield positive, and that process needs to be managed very carefully considering the size of the Fed’s balance sheet ($2.4 trillion in Treasuries, $1.7 trillion in mortgage backed securities). Bottom line, if the Fed changes the language on the reinvestment of the balance sheet (it’ll be in the second to last paragraph in the FOMC statement) then that would be incrementally hawkish, and we’d likely see bond yields and the dollar higher, and stocks lower. The market is not at all expecting any impending balance sheet changes from the Fed this soon in 2017. Help your clients outperform markets with your free trial of the Sevens Report.